Laying down deep roots in the soil of the Emerald Isle after arriving as twelfth century invaders, bearers of the Barry name readily adapted to and adopted the native culture – identifying themselves throughout succeeding centuries with Ireland’s cause. Some suffered, but many prospered, as do their descendants scattered throughout the world today. Read here their proud and vibrant tale. 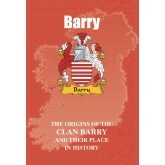 NAME VARIATIONS INCLUDE: Barre, Barrey, Barrie, de Barra, de Barry, du Barry. ..
As the original Gaelic-Irish clan of Ó Baoighill, Boyles have been a presence in Ireland from the earliest times. Further influxes of Boyles came in later centuries in the form of ambitious Anglo-Norman adventurers, while a further strain came from the neighbouring Celtic nation of Scotland. All their fates were inextricably entwined, and their colourful and often bloody tale is recounted here. NAME variations include: Ó Baoighill (Gaelic), O’Boyle, Baoghal, Boile, Baole, Boghill,..
Tracing a descent from the earliest Irish kings and of the same ancient bloodline as one of the island’s greatest heroes, the Bradys performed a significant role on the stage of Ireland’s history. They furnished not only poets and distinguished churchmen but also carved a name for themselves far from the shores of their native land. 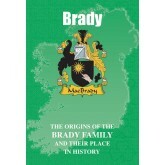 Read here the proud tale of the Bradys – and of their curious link to the equally proud O’Gradys. NAME variations include: MacBradaigh (Gaelic), Bradi.. 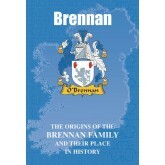 Claimants to a truly illustrious heritage, the thousands of Brennans scattered across the globe today have strong and sturdy roots in the ancient soil of Ireland. Their history thrills to the tune of legend, myth and magic, while their ancestors fought heroically in the cause of their homeland’s freedom. Brennans have also excelled in the world of invention, and no less so than Louis Brennan, born in 1852 in Castlebar, Ireland, and who later immigrated to Austral.. Although they arrived as invaders and adventurers, the Burkes came to adopt the ancient Irish way of life as they amassed rich territories and acquired high honours. Contributing significantly to the rich tapestry that is Ireland’s story, they played key roles at pivotal points in the island’s dramatic story, while others forged new lives for themselves in foreign lands. In the world of music, James Burke was the American composer born in 1884 whose memorable son..
As one of the ancient Irish clans, the Byrnes and their namesakes the O’Byrnes have stamped an indelible mark on the pages of the nation’s history. Descended from the High Kings of Ireland, their ancestors also include doughty warriors and freedom fighters, while in more recent times they have gained distinction through a rich variety of endeavours. One the stage, Dublin-born Gabriel Byrne is the star of films that include Excalibur, Defence of the Realm, Stigmat.. 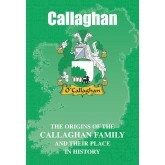 Maintaining an often-precarious existence in Ireland since earliest times, the Callaghans were at the forefront of the bitter and bloody resistance to invaders from across the seas. As a truly native Irish clan, their pedigree was illustrious, with a descent from one of the island’s most celebrated warrior kings. 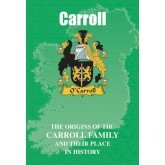 In contemporary times and in the world of politics, Jim Callaghan, later Baron Callaghan of Cardiff, was the Labour Party politician who served as Briti..
A family with aristocratic roots embedded deep in the ancient soil of Ireland, the Carrolls were for centuries at the forefront of key events in the rich and bloodied tapestry of the nation’s history. Proud defenders of their heritage and beliefs in the face of aggression, they truly lived up to their family motto of ‘Strong in faith and war.’ In more contemporary times and on the stage, Leo G. Carrol was the British-born star of Alfred Hitchcock movies that incl.. Known originally as the Ó Cathasaigh, or O’Casey, the Caseys of today can lay claim to a glorious pedigree that reaches back through time to the ancient warrior kings of Ireland. From the bloody field of battle to the creative world of the arts, generations of the name have stamped an indelible mark. Seán O’Casey, born John Casey in 1880 and arguably one of the most famous Irishmen to have born the name of ‘Casey’ in all its varied forms Sean O’Casey, born in Dub..
Celebrated for their contribution to Irish literature, Celtic medical lore and the religious life of the island, bearers of the name of Cassidy flourished for centuries in the ancient province of Ulster. As hereditary physicians to the Maguire chiefs of Fermanagh, they shared in both their fortunes and misfortunes and became victims of the final collapse of the Gaelic order. 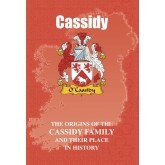 In much more peaceful times, David Cassidy is the American actor and singer best known fo..
‘Fidelity and fortitude’ is the proud motto of bearers of the Clancy name, and these were qualities they displayed to the full as they stamped their mark on Ireland’s history down through the centuries. Many were exiled to foreign shores for their steadfast adherence to the ancient Gaelic cause, while others campaigned vigorously for the right to self-determination. 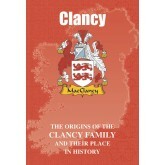 In more peaceful times and in the world of political thrillers, Tom Clancy was the best-selling Am..
Two of the sources for the proud name of Collins in Ireland stretch back to the heroic age of Celtic myth and legend, but no less colourful and poignant are the lives and times of bearers of the name in much later ages. From the twilight of the ancient gods until the present day, their stirring tales are recounted here. 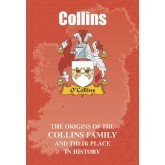 NAME variations include: Ó Coileáin (Gaelic), Ó Cuilleáin (Gaelic), O’Collins, O’Cullane, Cullane, Collinson. .. The Connollys have stamped an indelible mark on the saga of Ireland’s bitter and bloody struggle for freedom and independence, from as early as the eleventh century up to the early years of the twentieth. One of the ancient native Irish clans, their descent is truly illustrious and their heritage proud. The stirring and poignant tale of the Connollys is recounted here. 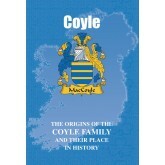 NAME variations include: Ó Conghalaigh (Gaelic), Ó Coinheallaigh (Gaelic), Ó Conghaile (Gaelic), O’Conolly, O’Con..
Ulster, which along with Leinster, Munster and Connacht is one of Ireland’s four ancient provinces, is the original homeland of the Coyles, whose name derives from that of a celebrated sixth century saint. In contemporary times and in the creative world of the written word, Harold Coyle is the best-selling American author of historical and war novels that include Sword Point, Trial by Fire and Cat and Mouse. In the music world, Nadine Coyle, born in 1985, i.. Renowned for centuries as poets, scholars and guardians of ancient Celtic tradition, bearers of the Daly name are also of truly royal race. Their main territory was near the Hill of Tara, sacred heart of the Emerald Isle, while other branches of the clan flourished in areas that include present day County Galway. In contemporary times and on the stage, Tyne Daly is the award-winning American actress best known for her role of Christine Cagney in the 1980s’ police..